I was sitting here in my pyjamas on a Sunday morning thinking that I just didn't have enough reading challenges on the go (yes, that is tongue in cheek) when I stumbled across another challenge that I am going to join in on. This is the second year that this particular challenge has been running, but I didn't join in last year because I wasn't doing challenges at all this year. How things change! 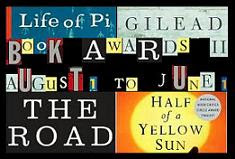 Read 10 award winners from August 1, 2008 through June 1, 2009. You must have at least FIVE different awards in your ten titles. You don't have to post your choices right away, and your list can change at any time. 'Award winners' is loosely defined; make the challenge fit your needs, keeping in mind Rule #2. This challenge fits in nicely with several of my long term challenges which are to read the Booker, Pulitzer and Orange Prize winners, plus I would like to read some more Miles Franklin Award winners as well. I am not going to list the books at this stage though. I'm taking part in that challenge, too. I'm also seriously considering the July Book Blowout. I've got about 6 ARCs to read and none of them are historical fiction. If I can get through those, I will have the 10 I've set for this challenge and then I can work in Katherine by Anya Seton and some other things I'm longing to read. I'm looking forward to seeing what you pick for your 10 books. Kerrie - Ned Kelly award winners. Hmm...I'm off to investigate! Thanks for the tip! Literate Housewife, TeddyRose has a got an ARC reading challenge going if that would help you get through them! Thanks for posting about this contest. I'm pretty sure that I'm going to have to join up. I love those award winners!